Matthew Barrett is Associate Professor of Christian Theology at Midwestern Baptist Theological Seminary, as well as the founder and executive editor of Credo Magazine (www.credomag.com). He is the author of several books, including Salvation by Grace, Owen on the Christian Life, God's Word Alone: The Authority of Scripture, and Reformation Theology: A Systematic Summary. He is the series editor of The 5 Solas Series with Zondervan. He is also the host of the Credo Podcast where he talks theology with the best theologians today about the most important doctrines of the Christian faith (https://credomag.com/podcast/). As Christians, we read the Bible and often feel like we have a pretty decent understanding of who God is, don't we? He is the creator. He is the Father. He is the great I am. He is bigger than all things, timeless, GOD. But do we really understand that? I think that we want to, but oftentimes we put God's greatness into a box. God is SO great that we simply cannot wrap our minds around that greatness. In our lives as humans, perfection does not exist. Everything has it's flaws and it's shortcomings... and so we likewise place those limits on God. Yes, God is great... but surely He has His limits too, right? 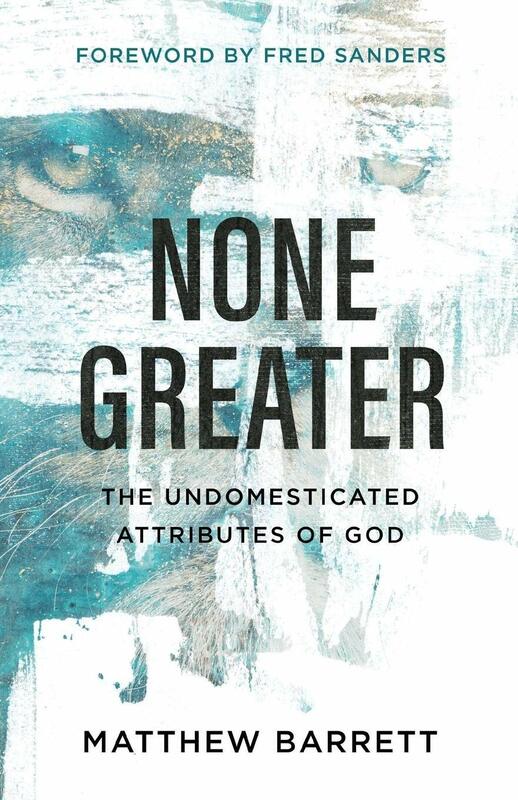 In his new book ' None Greater', Matthew Barrett wants us to look past those human made limits we have placed on God to truly help us understand His absolute greatness in a way that we have perhaps never really thought of before. He does so by breaking down the many attributes given to God through scripture. These attributes include: incomprehensibility, limitless, immutability, timeless, omnipotent, omnipresent... to name just a few. These attributes are broken down in each chapter with scriptural backing as well as thoughts from some of the greatest theologians in history. And it's certainly eye opening. I liked to think that I understood how much BIGGER God is than all of us, than everything we know... but really taking a look at just HOW big that is? Well, it's certainly shocking. This isn't what I would call an entertaining book. Interesting, absolutely... but not what I would personally consider pleasure reading myself... it was however important reading for us as Christians and one that I was glad to have read. If you truly want to dig deeper into the theology in the Bible and get a better understanding of just how great God TRULY is- beyond our human understanding and limitations- this is definitely a book I would recommend. 'None Greater' is available to purchase at your favorite Christian book retailers.